quality and taste. The quality of soup stock is determined by the right balance of bonito taste, sweetness, flavor, acidity, richness and fragrance. Preparing high qualityDASHI is a very delicate and difficult process in Japanese cuisine. It is a common opinion in Japan that 10 years of training is required to master the transforming characteristics of ingredients throughout the various seasons and prepare stock consistently with bonito and kelp. Dried Bonito Dashi Pack includes highly selected all-natural dried bonito with bonito extract coating. 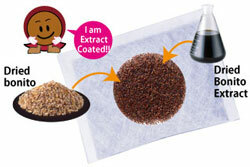 This bonito extract is the secret to providing high grade stock with consistency and without fluctuations. This is the reason many chefs of Japanese cuisine have chosen our product for over 30 years. For more details aboutDASHI please check from here. What is Dashi? Why we make Dried Bonito Dashi Pack? kelp, you must strain the stock which requires holding a large pot in hand. world regardless of water type. seasonings will leave poor aftertaste on your tongue. consistency in flavor and not meant as an additive for flavor. How could I improve the current menu? How could I create a buzz with a new menu? How could I improve and simplify our process? sake in the most skillful manner for its perfect balance. from dried bonito flakes and kelp. Storing: After opening, please store in a freezer. traditional seasoned rice with meat and vegetable ingredients. tripling the amount of bonito flakes used in general broth making process. from real “dashi”, as opposed to bland flavor created by artificial seasoning. extract the stock, resulting in increased work productivity. Paper packaging is used for its container in order to eliminate quality degradation. This will largely prevent loss of fragrance and flavor compared to plastic bottle containers. And the paper allows a slim design which won’t take up space and will be easy to discard. and a great variation of flavor and color exists depending on the ingredient. Around the year 1900 C.E., noodles types that differed from conventional udon or soba arrived in Yokohama City from China. Although it did not contain any buckwheat (soba), it was referred to as Chinese Soba, and with modifications to create a unique Japanese taste to meet the demand, it was embraced by the common population. Gradually, it began to be known as Ramen, and many original flavors started to spring across the country. The origin behind the name ramen is uncertain. With chicken and pork forming the base stock, it is common to add vegetables, kelp and various types of dried sardines and other types of fish that goes well with soy sauce. A wide variation is available for type of soups from clear, cloudy and thick type of soups. Main characteristic of the soup will be even more pronounced with this type of broth than soy sauce based broth. The broth will be lighter overall than other types and most variations keep it on the lighter side. This type of ramen saw its beginning when noodles were put into miso based pork soup. Main features include topping stir fried vegetables on rich, thick miso based soup. The broth will be thick with cloudy white color from the extracted ingredients of the pork bones, boiled with a strong heat for an extended period of time. thick flavor and result in its distinctive flavor. Why the Japanese infatuation with Ramen? (True Bonito) and “Don Don Series Bonito Tsuyu”. minutes at medium heat, and take it out. Add chicken wings and leeks and with closed lid boil for 1 hour at low heat. and boil for 2 to 3 hours. Mix Don Don Series Bonito Tsuyu and water in a pot. 1 hour on low heat with the lid on. Once the skins are crispy, add ginger and leeks and turn off heat. After taking out the ingredients and filtering the extracted oil, it’s complete. Tsuyu in a zip lock bag with eggs and water and let it sit for a day. Unstring the Roast Pork (cha-shu) and slice it thin. Cut the poached egg in half. Cut the spinach after running it through boiling water for short while and rinse with water. Soak the scallions in cold water for 10 minutes after slicing and drain the water in a strainer. Boil the noodles by placing it in plentiful boiling water. Make sure to drain the water well from the noodles and add in the bowl, loosen it up a bit by stirring lightly and top it with roast pork, poached egg, spinach and scallions. the umami essence of seafood and meat stock. the flavors, the Japanese also celebrated the visual aspects as well. affecting its natural colors, it will bring out the natural umami essence. and meat all together in a single cup. water with a touch of salt and cook it lightly for deshelling. #3. Make egg solution. Add 25c of Don Don light Tsuyu and 300cc of water. pores to make smooth textured solution. small pores to make smooth textured solution. clear liquid appears, then it is done. before use. When washing the leaves, please use water and rinse quickly. for a long period after opening the seal, then please store in a freezer. 5 Colors: Visual effect from white, black, red, blue (green) and yellow. sense of touch (temperature), and sense of taste (seasoning). of the land is covered with trees and forests providing great fresh foods. and ginger, which are indispensable for foods such as sushi and sashimi. a solution to overcoming a tall order of “keeping the bamboo leaves fresh as long as possib” from chefs of Japanese cuisine.